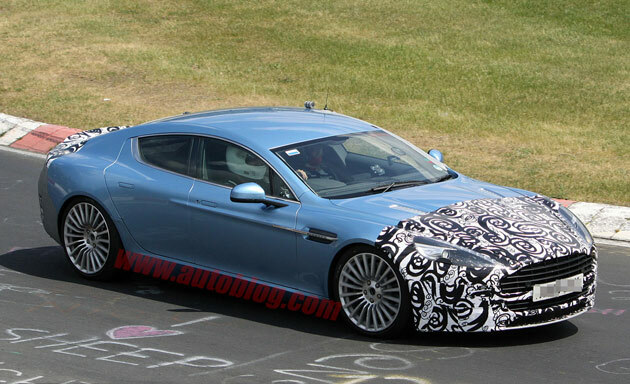 Word on the street is that Aston Martin is developing a faster, more powerful version of its Rapide four-door, a rumor fueled by new spy shots snapped near the company's Gaydon headquarters in Warwickshire, England. The camouflaged prototype pictured above appears to pack a revised front end and tail, with larger intakes up front and a lip spoiler and reshaped bumper around back. Underneath the revised fascias, sources expect to find the 510-horsepower V12 from the DBS to upgrade from the DB9-spec 470-hp mill already in place in the "standard" Rapide. Couple this with carbon-ceramic brakes and revised suspension, and the Rapide S is starting to shape up as a real barnstormer. In short, if the existing Rapide is a four-door DB9, expect the Rapide S to come in as a four-door DBS - suitable for carrying 007 and not just one, but three Bond girls to their next mission or exotic locale.Aston Martin Rapide S undergoing testing in England originally appeared on Autoblog on Thu, 26 May 2011 13:00:00 EST. Please see our terms for use of feeds. gotta clean up this mess brb.